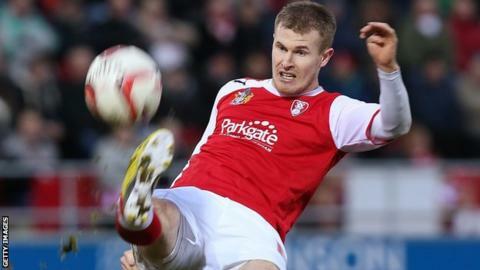 Rotherham United have released seven players after beating Leyton Orient in including midfielder Michael O'Connor. The 26-year-old played 35 games this season, while keeper Scott Shearer, 33, and centre-back Claude Davis, 35, leave after playing 33 times between them. Out-of-contract trio Wes Thomas, Kari Arnason and Mark Bradley have all been offered deals to stay at the club. David Noble, Kayode Odejayi, Lionel Ainsworth and Danny Schofield depart. Midfielder Noble was the only player to make a Millers appearance this season and, along with Odejayi and Ainsworth, he ended the campaign out on loan. Manager Steve Evans has also transfer-listed David Worrall and Danny Hylton. Development contracts have been offered to youngsters Mitch Rose, Nicky Walker, Tony Thompson, Daniel Rowe and Reece Lucas. Read more on Steve Evans: Rotherham manager urged play-off "desire"